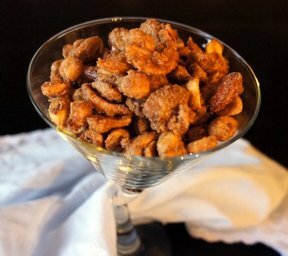 Cinnamon and sugar coated mixed nuts with a hint of cayenne in the background. Perfect to serve in fancy glasses for your guests. Whip egg white and soft butter until fluffy. Place nuts, sugar, cayenne, and cinnamon in a plastic bag. Add egg white mixture to the bag. Shake well to coat. 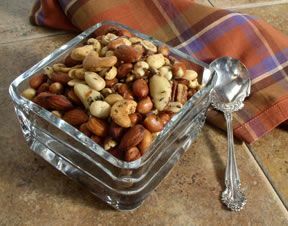 Spread nuts on a lined baking sheet and bake at 275° for 30-40 minutes, stirring every 10 minutes to prevent sticking. "Have you ever had the cinnamon roasted almonds at the fair? Now you can make them yourself. These are delicious. Loved the hint of spice. I made with Splenda and it worked perfectly. I found it hard to get the egg whites fluffy with the butter but I used them anyway and it turned out."